February 5, 2015 – ESA’s Rosetta probe is preparing to make a close encounter with Comet 67P/Churyumov–Gerasimenko on February 14, passing just 6 km from the surface. This marks the end of the current orbiting period and the start of a new phase for the rest of this year. 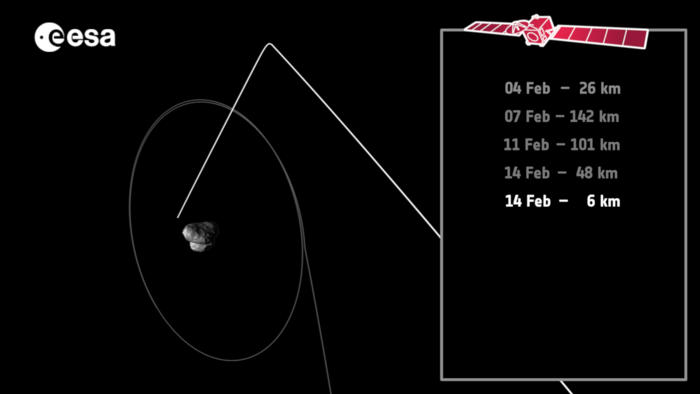 Rosetta is moving into a new path ahead of a very close encounter next week. First, it will move out to a distance of roughly 140 km from the comet by February 7, before swooping in for the close encounter at 12:41 GMT (13:41 CET) on February 14. The closest pass occurs over the comet’s larger lobe, above the Imhotep region. “The upcoming close flyby will allow unique scientific observations, providing us with high-resolution measurements of the surface over a range of wavelengths and giving us the opportunity to sample – taste or sniff – the very innermost parts of the comet’s atmosphere,” says Matt Taylor, ESA’s Rosetta project scientist. The flyby will take Rosetta over the most active regions of the comet, helping scientists to understand the connection between the source of the observed activity and the atmosphere, or coma. In particular, they will be looking for zones where the outflowing gas and dust accelerates from the surface and how these constituents evolve at larger distances from the comet. The comet’s surface is already known to be very dark, reflecting just 6% of the light that falls on it. During the close flyby, Rosetta will pass over the comet with the Sun directly behind, allowing shadow-free images to be collected. By studying the reflectivity of the nucleus as it varies with the angle of the sunlight falling on it, scientists hope to gain a more detailed insight into the dust grains on the surface. “After this close flyby, a new phase will begin, when Rosetta will execute sets of flybys past the comet at a range of distances, between about 15 km and 100 km,” says Sylvain Lodiot, ESA’s spacecraft operations manager. It was always planned to change from ‘bound orbits’ to flyby trajectories at this point in the mission, based on predictions of increasing cometary activity. The range of flyby distances also balances the various needs of Rosetta’s 11 instruments in order to optimise the mission’s scientific return. During some of the close flybys, Rosetta will encounter the comet almost in step with the rotation, allowing the instruments to monitor a single point on the surface as it passes by. Meanwhile, the more distant flybys will provide the broader context of a wide-angle view of the nucleus and its growing coma.